I have received this press release from the Sainsbury Centre for Visual Arts at the UEA in Norwich. If you haven’t yet visited the Centre I recommend that you do so as it is a wonderful exhibition space. Previously unseen letters between distinguished writer John Berger and artist and filmmaker John Christie will go on public display at the Sainsbury Centre for Visual Arts this May. John Berger is a heavily influential art historian renowned for his essay Ways of Seeing and multiple celebrated BBC series’, as well as being a Booker Prize winning novelist. Coinciding with Berger’s 90th birthday, the upcoming exhibition will run from 7 May and brings together their letters and Artist-books alongside major works from the Robert and Lisa Sainsbury collection, which will be displayed in a new light. 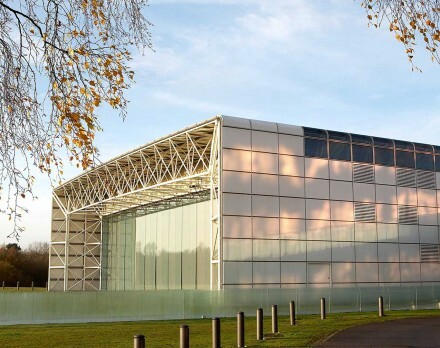 The letters begin with a proposal by Christie: ‘Dear John, I would like to take you on a visit to a favourite place of mine, the Sainsbury Centre.’ As the two friends share thoughts on some favourite pieces of art, their correspondence uncovers personal memories, shared life experiences, and philosophical reflection. Looking Beyond: Conversations between John Berger and John Christie presents Berger and Christie’s correspondence as an inspiring starting point for every visitor to look more closely at the artworks around them. The exhibition’s situation builds on the East Gallery’s function as a space to explore and expand on the Living Area collection. By asking visitors to reflect on what artworks mean to them, the exhibition encourages new conversations about the Sainsbury Centre’s collection. Original letters, postcards and Artist-books will be displayed alongside artworks that have caught both writers’ imagination including the intriguing photograph of a sleeping pilgrim, a lively Roman Hare statue and a Mexican mask from 900-600 BC. Looking Beyond is curated by University of East Anglia postgraduate Museum Studies students. Student exhibitions in previous years have included Global East Anglia in 2015 and Moore in Focus: A Friendship in Letters in 2014. The new publication Lapwing and Fox will be the most recent in a series of collaborations between author Berger, and artist Christie, whose pieces feature in Tate Modern’s collection. Past collaborations include I Send You This Cadmium Red, a book of correspondence with the theme of colour, published in 2000, as well as Another Way of Telling, a BBC television series on photography. Looking Beyond: Conversations between John Berger and John Christie will be open to the public from 7 May until 27 November at the Sainsbury Centre for Visual Arts, University of East Anglia, and will be free to view. The accompanying programme of film screenings, performances, family activities and workshops, including creative writing and book-making, will frame the conversations as inspiration for each visitor to look closer at the art around them and to start discussions of their own.